22 MMS October 2017 mmsonline.com RAPID TRAVERSE Machining Technology in Brief M any of the new designs for both military and civil aircraft turbine engines feature blisk rotors instead of single-bladed rotor assemblies because they offer significant reduction in weight, greater resilience and reduced maintenance. Blisks are usually machined from a solid billet of hard, exotic materials, such as titanium and nickel- based alloys, which means they can be difficult to machine and their cycles times can be long. Subsequently, these components become very expensive to produce. As a result, efficient machin- ing methods are needed. 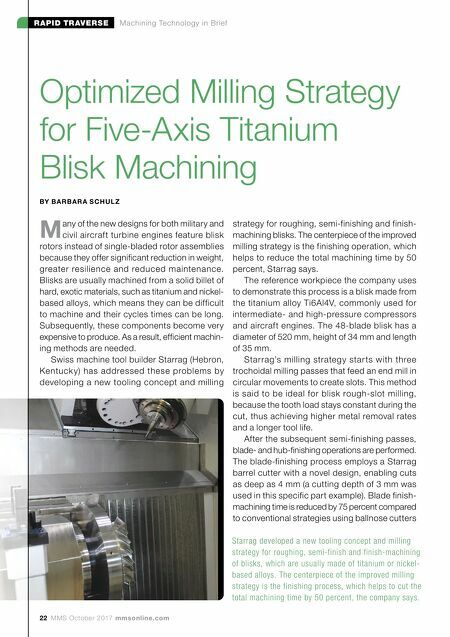 Swiss machine tool builder Starrag (Hebron, Kentuck y) has addressed these problems by developing a new tooling concept and milling Optimized Milling Strategy for Five-Axis Titanium Blisk Machining BY BA R BA R A S CH U L Z strategy for roughing, semi-finishing and finish- machining blisks. The centerpiece of the improved milling strategy is the finishing operation, which helps to reduce the total machining time by 50 percent, Starrag says. The reference workpiece the company uses to demonstrate this process is a blisk made from the titanium alloy Ti6Al4V, commonly used for intermediate- and high-pressure compressors and aircraft engines. The 48-blade blisk has a diameter of 520 mm, height of 34 mm and length of 35 mm. Starrag's milling strategy star ts with three trochoidal milling passes that feed an end mill in circular movements to create slots. This method is said to be ideal for blisk rough-slot milling, because the tooth load stays constant during the cut, thus achieving higher metal removal rates and a longer tool life. After the subsequent semi-finishing passes, blade- and hub-finishing operations are performed. The blade-finishing process employs a Starrag barrel cutter with a novel design, enabling cuts as deep as 4 mm (a cutting depth of 3 mm was used in this specific part example). Blade finish- machining time is reduced by 75 percent compared to conventional strategies using ballnose cutters Starrag developed a new tooling concept and milling strategy for roughing, semi-finish and finish-machining of blisks, which are usually made of titanium or nickel- based alloys. 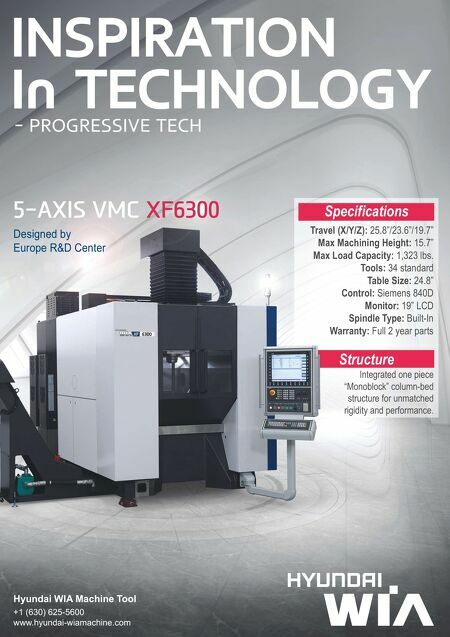 The centerpiece of the improved milling strategy is the finishing process, which helps to cut the total machining time by 50 percent, the company says.